You'll be £15.00 closer to your next £10.00 credit when you purchase Combat Biplanes of World War II. What's this? The era of the combat biplane is usually thought to have been between 1914 and 1938. By the outbreak of World War II, most of the advanced air forces of the world had moved on to monoplane aircraft for their front-line battle forces, both in bomber and fighter capacities. Yet despite this, many biplanes did still survive, both in front-line service and in numerous subsidiary roles, and not just as training machines but as fully operational warplanes. Thus in 1939 the majority of major European powers still retained some, albeit few, biplane aircraft. Sadly, and as an indictment of failed British Government defence policies, it was Great Britain who still had the bulk of such obsolescent combat aircraft, machines like the Gladiator, Swordfish, Walrus, Vildebeeste and Audax for example, while the inferior Albacore, meant to replace the Swordfish, was still yet to enter service! Germany had relegated most of her biplane designs to secondary roles, but they still managed to conduct missions in which biplanes like the He.50, He.51 and Hs.120 excelled. Both France and Italy had biplanes in active service, Mussolini's Regia Aeronautica attaching great importance to the type as a fighter aircraft as late as 1941, while the Soviet Union also retained some machines like the Po-2 in front-line service right through the war and beyond. In addition, a whole range of smaller nations utilised biplanes built for larger combatants in their own air forces. By the time Japan and the United States entered the war two years later, they had mainly rid themselves of biplanes but, even here, a few specialised types lingered on. This book describes a selection of these gallant old warriors of all nations. They represent the author's own personal selection from a surprisingly large range of aircraft that, despite all predictions, fought hard and well in World War II. In a conflict that introduced operational turbojet propulsion, ballistic missiles and nuclear weaponry, Pen & Sword offers intriguing accounts of aerial anachronisms. And the title tells it all. ... Smith’s admirably annotated and indexed effort proved highly informative – and thoroughly entertaining. I loved it. This book is a rare, well written treat that delves deeply into a period that has been long overshadowed by World War II. 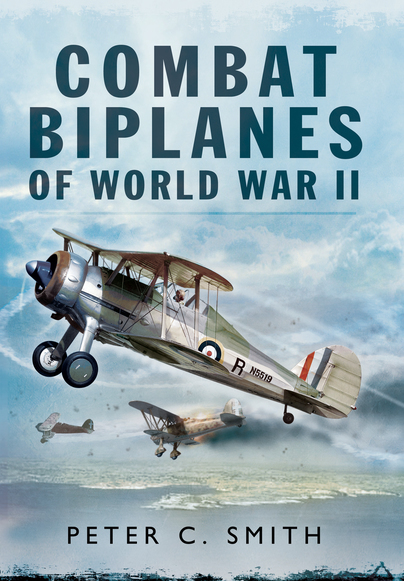 It is highly recommended for anyone with a broad interest in military biplanes of the 20th century.